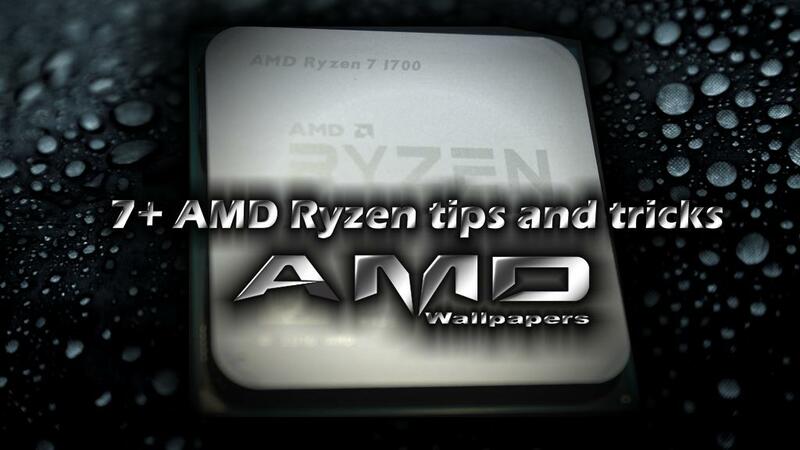 7+ AMD Ryzen tips and tricks | AMDwallpapers.com Free 4K HD wallpapers or backgrounds for your desktop and mobile devices. There are many articles on the web about “7 AMD Ryzen tips and tricks”. All are very similar to one another. As you read, you will find that this article is similar as well. We hope that the small differences will be worth reading our take on the “7 AMD Ryzen tips and tricks”. Now that AM4 motherboard reviews are showing up it will be easier to find the one that best fits your budget. First question that comes to our minds is whether or not to overclock. Of course we will! Overclockers will want to purchase a motherboard with control over the reference clock or system bus. This will aid in overclocking by allowing you to tweak CPU clocks that little extra. We have found some “Gaming” motherboards to suffer from low reference clock. Instead of running 100MHz they may be running 99.8MHz for example. When this is multiplied by 30 the CPU will only be running 2994MHz instead of 3000MHz or 3.0GHz. You might say this is insignificant but when multiplied by an even higher multiplier it only gets worse. Motherboards currently without the option to adjust the reference clock have no way of overcoming this shortcoming. Rumor has it that a BIOS update will not add this feature due to hardware limitations. Speaking on BIOS’s, look for motherboards that are getting a lot of attention by the manufacturer with frequent BIOS updates. I know that Asus has released quite a few updates for their ROG Crosshair VI Hero but only a few for their Gaming X370 Pro. Eventually all motherboards will get BIOS updates but the flagship models are getting more frequent updates and the most attention. In the end, no matter what memory you choose, the CPU will play a factor in memory overclocking stability. Do your homework on what memory to purchase, starting with the above list. AMD is stating that eventually memory compatibility and overclocking potential will be improved. AMD has suggested that they will be updating manufacturers in May. Yeah, we can’t wait either! Obviously, the better cooler will improve overclocking ability. If you don’t plan on overclocking, the stock Wraith cooler or comparable air cooler will suffice. We have found that some CPU coolers do not have a perfectly flat cold plate. Even modern coolers suffer from this. If the portion that contacts the CPUs IHS is not flat, your cooling will suffer or worse. You could end up with an air bubble between the cooler and the IHS. This issue isn’t wide spread however it does occur. You can check by using a straight edge. If your cooler shows a dip, be sure to fill that spot with enough thermal interface material to fill the gap. If it is bad enough, return the cooler. Larger water coolers will run quieter in the long run while the CPU is taxed heavily. This may impact which case you should consider. Overclockers will want a case that is compatible with the cooler they have chosen. Larger cases not only support larger coolers they also provide lower internal ambient temperatures. Every other article about the “7 AMD Ryzen tips and tricks” has included a portion to advise everyone to stay on top of BIOS updates. This is great advice for the time being while Ryzen and AM4 are brand new. BIOS updates are slowly improving stability and performance. Some are correcting major issues to prevent “bricking”. We touched on the BIOS under the motherboard section and feel this is the number one thing to focus on. After all, overclocking, memory selection and Windows timer issues are minor compared to a bricked motherboard. Be careful updating the BIOS, read all instructions thoroughly! Never update any firmware/BIOS while the system is overclocked. Even if you have found it extremely stable. Updating firmware/BIOS’s while the system is overclocked is asking for a bricked board. This too is a no brainer. AMD Ryzen is a brand-new platform. 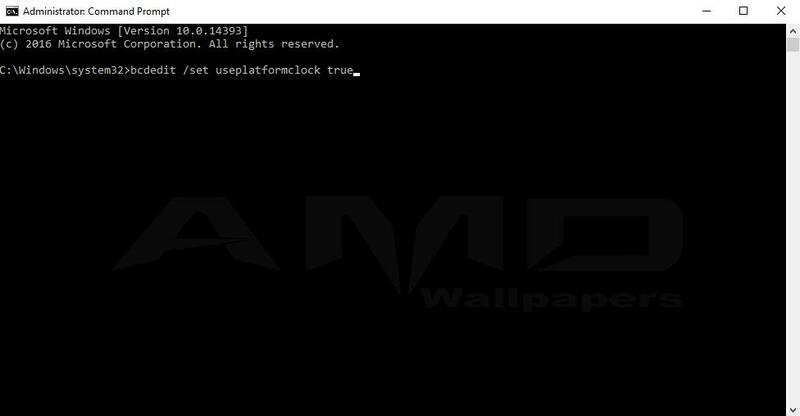 A fresh install is strongly advised by AMDwallpapers and AMD. AMD’s own testing has shown improvements by freshly installing Windows 10. Some of you may have old installs with software you no longer have the media for. Some simply have a massive amount of apps installed and configuration changes that make a fresh install a daunting task. We suggest biting the bullet and getting it done. Overclocking offers performance gains not otherwise available. This holds especially true for those who purchased the AMD Ryzen 7 1700. 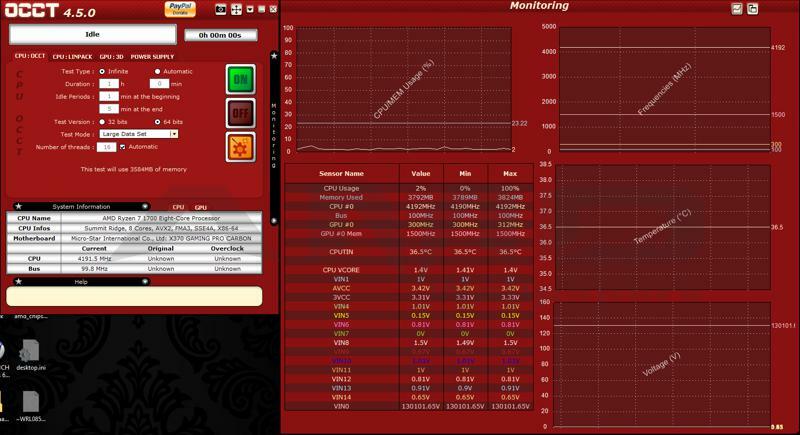 Our own testing with the 1700 has shown great results with overclocking. We were able to overclock our 1700 past the 1800X’s turbo speed. During testing only overclock one item at a time. Start with the memory and only the memory. Finding the highest stable system bus speed with the highest memory multiplier should be priority. The higher the system bus the better the overall performance of your system will be. Relax your memory timings and manually set the voltage to 1.35v, if this is the voltage of the memory you have chosen. Some have reported that even numbers on the timings have yielded better results. Begin raising the reference clock or system bus until stability is an issue. Then bring it back down to a stable setting. Now raise the memory multiplier one setting at a time testing stability each time. Once you have found the maximum system bus and memory speed you can tweak the voltage on your memory to squeeze a little more out of it. Overvolting long term will most likely cause damage to the memory and other system components. Rated voltage is a setting the manufacturer has tested and found to be absolutely safe. Most memory can handle a tad more than the manufacturer’s rating. Going outside of manufacturer’s rating will void the warranty, if they can prove it. There are some risks when overvolting; however, it can be safely done in small amounts. Case cooling and memory cooling is crucial when overclocking and or overvolting memory. Now that the maximum stable memory speed has been found, lower memory timings can be tested. Some memory multipliers have been found not to work properly with some RAM. Sometimes you will need to skip one or even two multipliers to POST. Once maximum memory frequency has been achieved the CPU can now be overclocked. Since most Ryzens will hit 3.8GHz this might be a good starting point. You should set the CPU core voltage to the maximum setting you feel comfortable running long term and then find the stable overclock. With the system bus overclocked the CPU multiplier won’t be as simple. Most motherboard’s BIOS will show the projected CPU clock. In some cases, the system bus may need to be reduced to attain stability at a certain CPU clock speed. You will need to test system bus related devices for stability as well. This process is time consuming however it will yield better performance than just cranking up the memory and CPU multipliers. For those that have a motherboard without system bus adjustments, start with the memory as well. Find the maximum stable memory speed at your memory’s rated voltage. Minor overvolting can help get faster speeds when proper cooling is in place. Now you can crank up the CPU multiplier. We suggest trying 50MHz jumps or .5 multiplier increases. When the system becomes unstable back the multiplier down in 25Mhz jumps until stability has been regained. Once you have found your maximum CPU clock speed, you can begin testing lower voltages. AMD does not recommend running Ryzen CPUs above 1.375V long term. We think AMD is being conservative with that number, however, overvolt at your own risk. Overvolting long term will most likely cause damage to the CPU and other system components. Keeping the CPU’s load temps down to a level that prevents throttling is recommended. Overclock at your own risk. Overclocking tests should be done before fully setting up your computer with software. Sometimes file corruption occurs from overclocking too high. This could leave your OS or applications in a state of disrepair. We recommend imaging the OS drive right after the fresh load. While overclocking, be prepared for boot record issues and corrupt registry hive files. This is a crucial step in any system build. This is doubly so when overclocking. We like to use OCCT to test for stability. OCCT tool can test all cores at maximum load. If it detects instability the test will terminate without crashing your system. OCCT can be found at: http://www.ocbase.com/. Prime95 is an old and tested method for stability testing. Don’t trust just one tool. Run tests with either OCCT or Prime95 and also run a series of benchmark tests to further prove stability. Once the system has been tested stable, begin using it. Ultimately, using it day in and day out will show whether it is truly stable. Backup your work often, for a few days, while working with an overclocked system. AMD is currently recommending everyone to change their power setting to “High Performance” due to issues with parking cores. Currently Windows 10’s “Balanced” mode takes up to 30ms to adjust CPU frequency and this has caused some performance issues. AMD has stated that the onboard SenseMI Pure Power and Precision Boost, better handles the CPU’s power state. 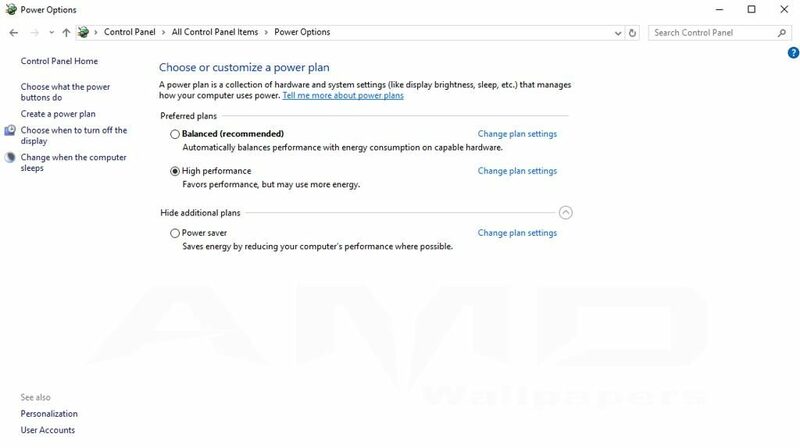 AMD has shown, during testing, that Ryzen works well with High Performance Event Timer while using Windows “Performance” power plan. According to Robert Hallock, 1080p gaming performance will go up with HPET enabled while using the “Performance” power plan. HPET will require enabling in the BIOS and in the OS. The command to enable it in the OS is done with elevated command prompt. “bcdedit /set useplatformclock true” A reboot is required. Currently, this is a mixed bag for gaming on Ryzen. Some tests have shown that disabling SMT will improve performance in games, while others show the opposite. We suggest testing this with your current favorite games. AMD wants us to leave SMT enabled. They are saying that this will get worked out eventually and all games will fully support SMT on Ryzen. It is easy enough to turn on and off to mange for now. Below are some of the other “AMD Ryzen tips and tricks” articles. We did review their articles, on a quest to find as many tips and tricks as possible.